The stories that got you started up the mountain were plentiful. After an earthquake the frozen maw at the peak cracked open and a world of splendors awaits those brave enough to climb its forbidding steppes and delve its depths. A drunk in the House of Seven Wonders held aloft a jagged spike of gemstone, a Dragon’s Tooth, that he said rolled right down the mountain and stabbed him in the foot. He still has the limp to prove it! Wise women gossip about gods buried inside the mountain, and their crypts laden in gold. There is even rumors of the Dragon’s Heart, an eternal flame, nestled inside Stone Dragon Mountain. 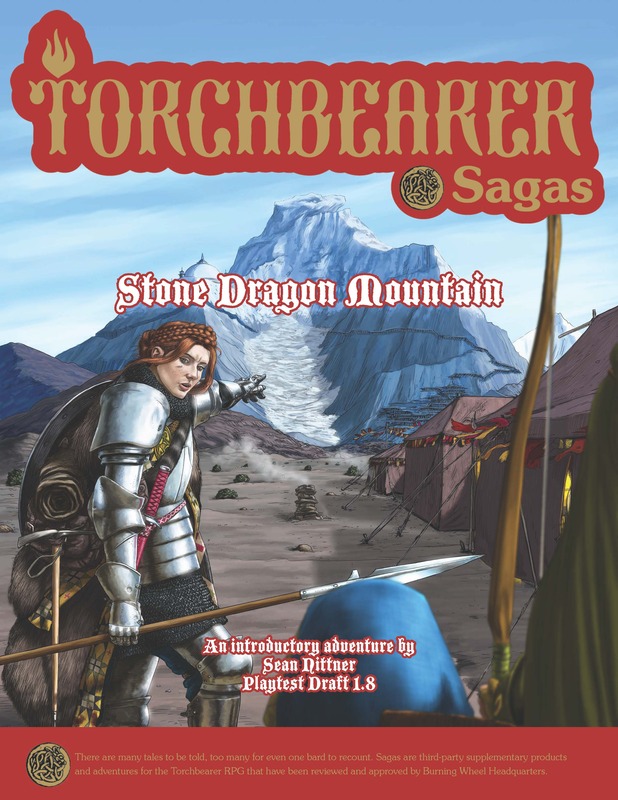 Stone Dragon Mountain is an introductory adventure for Torchbearer in development. The adventure starts with a climb up a deadly snow capped mountain and then into it’s depths. Many creatures, human and otherwise, call the mountain their home, and each of them will want something from the intrepid adventures, even if that something is the creature’s next meal. The adventure takes between 2-4 sessions to complete. The adventure was originally written in the summer of 2014 and I ran several playtests of it at Go Play Northwest, Gen Con, CelestiCon, and with my Google Hangout group. After the adventure felt workable to me, I hired Thor Olavsrud as a developmental editor…and together we ripped the adventure apart, took all the best parts, tossed the rest, and rebuilt it. Thor has improved the adventure a hundredfold! In 2015 I ran an an open playtest with over fifty groups participating and received a ton of fantastic feedback. After that I worked on shoring up the weak portions of the adventure and fleshing out the social structures. I also hired Michael Wenman to start making the four maps needed for the adventure. In 2016 I plan to complete the final edits and release this as a digital product! Maps – In development by Michael Wenman. Layout – Initial pass completed by Sean Nittner using the Torchbearer Saga’s Tradedress. Open Playtesting – Completed! Performing post-playtest revisions now. Interior Art – Development once final layout is complete. Copy Editing, Proofreading, and Final Layout preceding the open playtest. Hi Sean, any news on this being released for sale yet? Just stumbled upon this today so am curious. Great timing Michael. It’s over at BWHQ right not to prepare for printing. We’ll make a short run Kickstarter in May and then have them ready for sale Gen Con!